On September 15, 2018, I attended a panel discussion about Kaiju vs Heroes at the Japanese American National Museum in Little Tokyo in Los Angeles. The exhibition was terrific and inspiring. My enthusiasm for robots, specifically toy robots, and especially Japanese toy robots from the 1970s originated when I lived as an expatriate kid in the Philippines as a kid. Voltes V was a special favorite. To see an exhibit from an American kid whose brain likewise caught fire with a love for Japanese toys. Kaiju are great too, but for me it’s the robots. Giant and small automatons with personality, or giant mecha driven by heroic men women and kids, saving the universe. The inventiveness of those toy robots was astounding. My admiration for all things Japanese when I was in my teens originated in these toys. Here are my paltry sketchnotes from the day. The exhibition runs through July. If you visit Los Angeles, see it! In conjunction with the opening of “Kaiju vs. 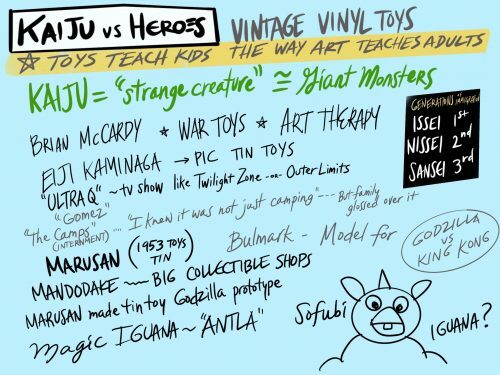 Heroes: Mark Nagata’s Journey through the World of Japanese Toys,” toy designer and collector Mark Nagata and Marusan toy company President Eiji Kaminaga will participate in a discussion about kaiju toy history, the world of Japanese toy collecting, and their companies’ histories (Nagata is the founder of Max Toy Company). The Marusan toy company created some of the first vinyl kaiju and hero toys of the 1960s and these toys make up a significant part of Nagata’s collection. The conversation will be moderated by Brad Warner, who worked for 15 years at Tsuburaya Productions, the makers of the “Ultraman” television shows. Warner is now an author and teacher of Zen Buddhism. Following the discussion, Mark Nagata will sign copies of “Toy Karma,” an accompanying book by and about Nagata, as well as a 13″ x 19″ print (10″ x 17″ image size) featuring a kaiju and hero image by toy photographer Brian McCarty, who will also be signing the print. The book is $24.95 and the print is $50. Both can be purchased the day of the event. Joe Crawford blogged this at 8:43am in 2019 in April. The 9th was a Tuesday. You are reading this 2 weeks later. Comment. There are no comments Tweet. Send email. It has hashtags→ drawings japan kaiju los-angeles robots .